The Severn Barrage is a proposed tidal power station to be built across the Bristol Channel (Severn Estuary). The River Severn has a tidal range of 14 metres – the second highest in the world – making it perfect for tidal power generation. 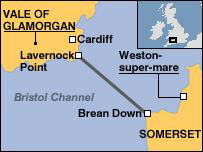 The 20 billion pound ($US30bn) Severn Barrage would involve the construction of a 10 mile long barrage (dam) between Lavernock Point south of Cardiff, Wales, and Brean Down in Somerset, England. 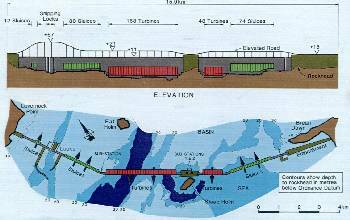 The barrage would act as a bridge between England and Wales and will have an operational lifetime of up to 200 years. It would be the world’s largest ever renewable energy project, and the UK’s largest engineering project since the Channel Tunnel. 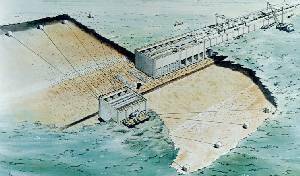 Along the length of the Severn Barrage open sluice gates would allow the tide to flow in. These gates would then be closed at high tide trapping enormous quantities of water behind the barrage. The tidal turbines along the barrage would generate the same amount of electricity as three of the latest nuclear power stations – 8.6 GW during flow and 2 GW on average. This would be sufficient to provide 5-6% of the current electricity usage of England and Wales – equivalent to 8 large coal-fired power stations. Producing on average in excess of 17 billion kWh of electricity annually, the UK’s carbon emissions would be cut by 16 million tonnes each year (assuming Severn Barrage electricity replaced electricity which would otherwise be generated in coal-fired power stations) which equates to 3% of total current emissions. The Severn Tidal Power Group (STGP) is a consortium of engineering and construction companies (Balfour Beatty, Taylor Woodrow, Sir Robert McAlpine and Alstom) formed in 1981 to work on making the Severn Barrage a reality. They suggest that the Severn Barrage could be constructed in just six to eight years for £15 billion £20 billion. A total of 200,000 man years of employment would be generated with a total of 35,000 jobs during the peak period of construction. They also suggest that a further 40,000 permanent jobs would be generated in Somerset and South Wales thanks to the benefits of the proximity of the new Severn crossing point. Shoot barrage – 1 GW. After a public consultation during 2009, the final decision will be made early in 2010. The environmental effects of a barrage across the River Severn would be enormous. The WWF, RSPB, and Friends of the Earth have all launched campaigns against the plans to construct the Barrage pointing out that the effects on wildlife in the Severn Estuary would be disastrous and irreversible. The Severn Estuary is designated a Special Area for Conservation. 85,000 migratory and wintering water birds (waders including oystercatchers, curlews, dunlins, ringed plovers etc) depend on the mud-flats which would be lost as a results of construction of the Barrage. In addition coastal erosion would be increased in some locations while additional silting would occur in others. The Barrage would also increase the likelihood of flooding along the coast on the seawardside. According to EU-wide wildlife habitat laws, upto 40,000 acres of compensatory habitat (e.g. marshes and/or mudflats) would have to be found at a financial cost of up to £3 billion. The effect on marine life would not be so extreme since the water in the Severn Estuary contains a lot of silt brought up from the seabed by the effects of the tidal range, however the Barrage could prevent salmon, eels, and other migratory fish from returning to spawn. With £20 billion spent on such an enormous project, it is very likely that resources would have to be diverted from other renewable technoglogies such a wind power which generate electricity with a much small environmental impact. There is still only one large scale commercial tidal power station in the world – La Rance Tidal Power Plant in Brittany, France. This currently generates 240MW of power and has been in operation for over 40 years without mechanical breakdown. Ref your [article] on the barrage it is welcome but could you please check some of your facts. 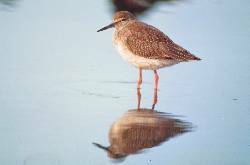 According to BTO, the estuary supported more like 62,500 wading birds, not 80,000. The RSPB figures are sadly incorrect and inflated. The BTO the very respected British Trust for Ornithology are scientifically based . That number is declining because of the effects of Global Warming as for example the Dunlin Population has been decimated over the last decades. Their numbers are now a third of what they were in the 70’s. Which has obviously nothing to do with a barrage. You cannot state that the effects will be disastrous. Because of an increase in Photosynthesis (which because of silt and turbidity there is virtually none at the moment) according to Prof Christian Retiere of La Laboratoire Maritime in Dinard there will be an explosion of bio diversity in the Severn after a barrage as he has proved at La Rance Barrage in France. There will be a change in type of birds but there will be actually more species and in greater number. Also similarly the effect on fish cannot be simply stated. At La Rance there has been no effect at all. The Turbines in the Severn will be larger and turn at half the speed of La Rance, where a man has passed through unharmed! I am afraid this is just more scare mongering not based on any empirical evidence. Finally the effect on flood prevention will be enormous and beneficial. Up Barrage control of the sluices in flood times will reduce water build up whilst preventing storm surge effects at High tides. Contra instinctually the water level on the seawide side of the Barrage will be lower because of the reduced Severn Surge effect. Again simply repeating myth and belief rather than science does no benefit to anyone in this argument. Without a Barrage Sea Level rises will drown thousands of acres over the next decade anyway, which will be disastrous and irreversible ! Whereas is we build a barrage the fecundity of the remaining 50% of the Mudflats will be massively improved due to an increase in bio-diversity from Photosynthesis. Chair of SeBAS Severn Barrage Supporters Assoc.